The following account was written for this site by Erik van Ingen Schenau, of the China Motor Vehicle Documentation Centre. In 1998 there was a press publication by the Chengdu Auto Works (Sichuan Province), a company belonging to the First Auto Works Group, one of China’s most important automotive corporations. 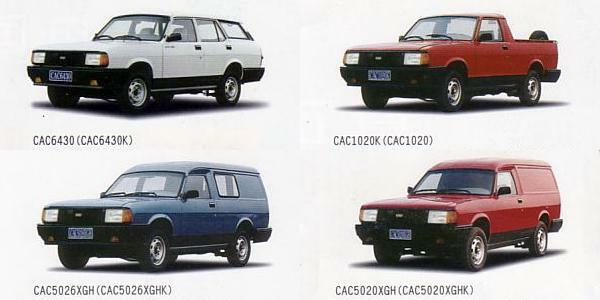 Chengdu Auto Works announced the start of the production of a CAC6430 estate car. In the newspaper clipping I possess (from the Chinese newspaper Zhonghuo Qiche Bao) you can clearly see a Morris Ital estate car. 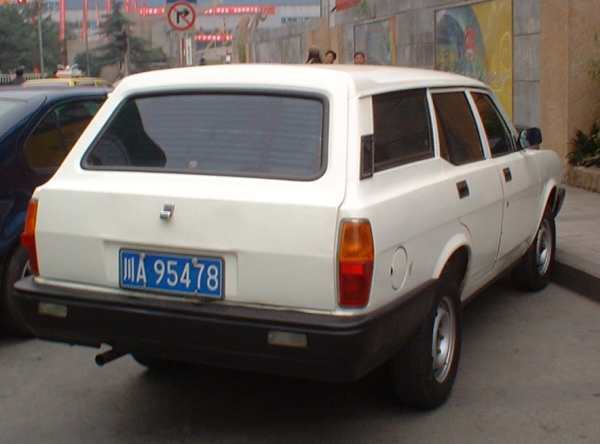 There is a second photo (taken from a different angle) published in a Polish yearbook named “Samochody Swiata”, with the text explaining that Chengdu Auto Works had been producing the Huandu CAC6430 five-seat sedan and estate car since 1998. In the designation CAC 6430, CA signifies First Auto Works; the second C stands for the Chengdu branch; 6000 is the bus series; and 430 means 4.3 meters long. So, the car is classed as a bus of 4.3 metres made by the FAW-Chengdu Auto Works. China has a specific designation for motor cars, but companies are only allowed to use it when they have permission from the central authorities in Beijing to produce motor cars. Using the bus designation is a normal (and accepted) way to avoid problems with Beijing. I travel each year in China, visiting car factories. In the early 1980s I visited Chengdu Auto Works and, even by Chinese standards, the factory was shabby, dirty and old fashioned. They were producing 2-ton (payload, 4 ton gvw) small trucks, named Chengdu CD130, later renamed Huandu. I have never been back there, but during my visits to China I have never seen an Ital or Marina, or a look-alike. 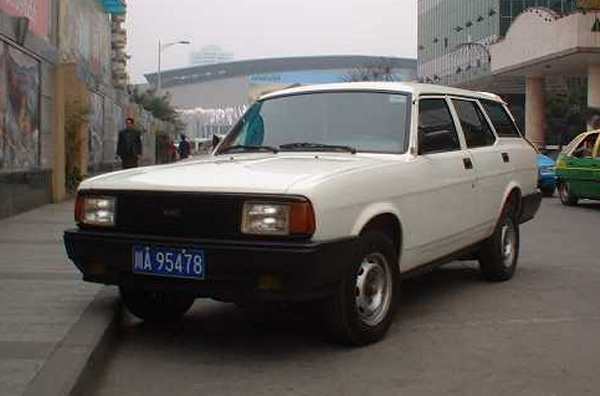 The Chinese Morris Ital is depicted in several versions. It has to be said that the full depth front bumper featuring integral fog lamps looks rather nicer than the original Austin-Morris version – as does the jacked-up ride height. Click the above image to view the original spec sheet (in Chinese). In December 1999 there was an auto workers demonstration in Chengdu. According a press release, the workers were from a state-owned Chengdu auto factory, which was closed in May 1999. The Chengdu Auto Works has since disappeared from statistics, handbooks etc., and they no longer respond to letters, faxes, emails. According to Juan Chen, Editor of AUTOCAR China, the text in the advert reads: “It is really a common people’s car. 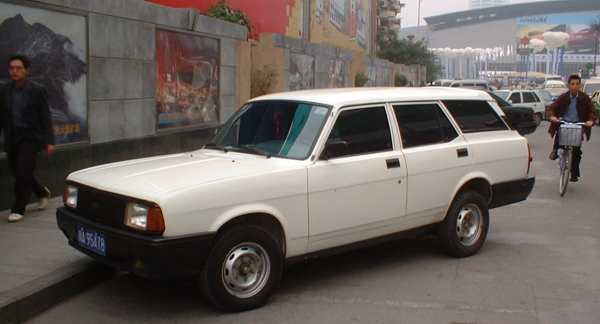 FAW brought in the body-in-white from Austin Rover, and use their own chassis, denoted 1021U2; the back seat is removable, so people can use this car for carrying goods. The price is less than 50,000RMB (£3700).” Interestingly, the Chinese name of the car has the same pronunciation as the English word, “Rover”, but the second character in the Chinese name differs from Rover’s official Chinese name. In 2000 another car with the CAC6430 designation showed up; this is quite unusual. It is the Qirui, a Seat Toledo made in Anhui Province, near Shanghai. 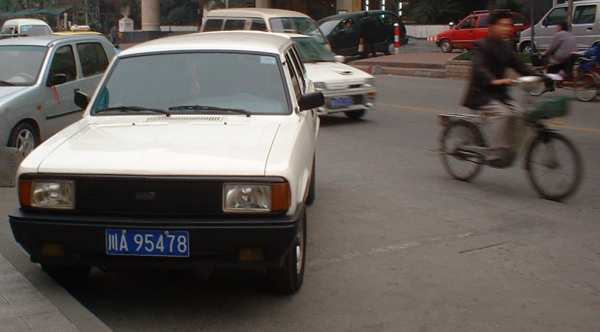 In 2001 the name was changed to Shanghai Qirui (Chery) SQR 7160. If you have these, will you tell me the price? I notice that the famous “Marina Door Handles”, used on everything else BL from Range Rovers downwards, have disappeared on this interesting blind alley. Is nothing sacred? Those where the door handles that all Ital’s had. A rather good design I thought that fitted into the same door skin aperture as the original flap handles. Beats me why having tooled up for these they only ever appeared on the Ital rather than finding their way onto the Metro, Maestro and Montego. I totally agree with your comments on that door handle. Why was it never used elsewhere? Its puzzled me for decades that thought. The surround looks like it was designed to be the same size as the Marina handles, so I supposed they can be fitted to the Allegro, Range Rover et al. IIRC the Princess & Ambassador used a different type of handles, that might have also been used on the Metro. The “Marina Door Handles” also disappeared on UK built Morris Ital’s. They weren’t sacred here either! Perhaps this bought about the downfall of British Leyland! Any trip to Huangshan also know as Yellow Mountain should be complimented with a visit to both Xidi and Hongcun in Anhui Province. drivers, guides, accommodation anything you may need for your adventure. are excellent for both painters and photographers alike. a vegetarian dish or the local cuisine which is normally with fish or meat. The jacked up ride height gives it a slight crossover SUV appearance! What did the new Chassis involve? Was it simply the existing Torsion bar/leaf spring arrangement beefed up to raise the ride height and payload, or did it involve a major redesign/replacement? And the answer as to why the Chinese gave up on communism is….. The fettling team must have missed that one! I wonder what the jacked up ride height did for the none to brilliant handling! Although I expect that ground clearance may have been more crucial than handling on Chinese roads! ..and that’s what you’d get if you made a 4×4 Ital, kind of like an AMC Eagle with all the showroom appeal surgically removed. Thinking about it, a 4×4 series of estates, Allegro & Marina and a Princess estate , would have made alot of sense for the right money… Especially for people like Prince “don’t worry I’m shooting over his head, honest” Charles and his mum. I can imagine the tagline “Princess AWD, the (really) poor man’s Jensen Interceptor”.. I recall the this project from my time on the engine performance test beds at Longbridge. We did a tune for something like 80 octane fuel on a SU carburatted low compression O series. Word was put out to locate a suitable Ital estate to purchase as amazingly there were none lying around. Happy days. Is that white car a Moskvitch? I wonder if something like the Ital would have been of interest to Lada, when it went out of production and relations improved between East and West after 1984. 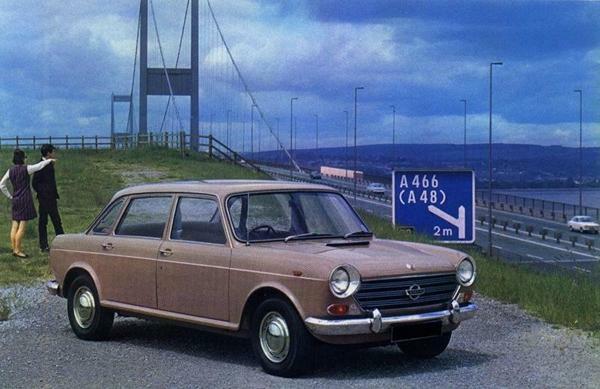 I suppose, as the Riva became old fashioned by the end of the eighties, Austin Rover could have sold them the design and the rights to the A plus and O series engines, or even continued making A plus engines for Lada when the Metro stopped using them in 1990. I’m sure a simple rwd four door saloon and estate which was more modern the Riva and sold for the same money could have been a winner, and made money for Rover. The guys from Cowley that went out to support the press tooling said that they accompanied the tools from the importer to the press shop. Tools still in wooden crates on trucks , them following in taxi. When they returned from the press shop in the evening. Furniture was for sale at the roadside made from the crates that the press tools had been delivered in….. I owned a 1981 1.7 O series Ital estate from ’85 until it died at 100,000 miles and a rusty floor in Januray ’90. Mechanically the car was very reliable and the only non standard maintenance was to replace the input shaft bearings in the gearbox. (A job I was familiar with as I had done it on a Triumph Herald in ’74 (same gearbox but the Herald had an alloy bell housing and was half the weight of the Ital’s)). According to my welding man the underseal had been applied to damp metal hence we arrived at a point of no return. I have read blogs about the handling of the bigger engined Marinas/Itals being evil but I had no such experience and ferried the family round quite comfortably. Perhaps the estate springs helped tighten things up.